The Azcue VB and VA VP/EP Self Priming Vertical Inline Pumps are the VB and VA long coupled centrifugal pumps supplied with a vacuum or electric priming pump, designed for where suction conditions may be difficult. For longer distances, the vacuum priming pump should be selected thanks to its ability to dry run for short periods of time. The Azcue VB & VA are large, robust and higher performance pumps with higher pressure and flow capabilities than the other Azcue vertical centrifugal pumps. The VA is the same as the VB but with bottom suction rather than line, giving you the option depending upon the installation at hand. Both models are ideal solutions for applications involving the high volume transfer of relatively clean liquids such as water and thin fuels, where space saving may be important. The VB & VA vertical inline centrifugal pumps are long coupled, making it easier to maintain as you can get to the pump head without removing the motor first, and more durable for continuous use as it has additional bearings in the pump head to share the strain of operation. 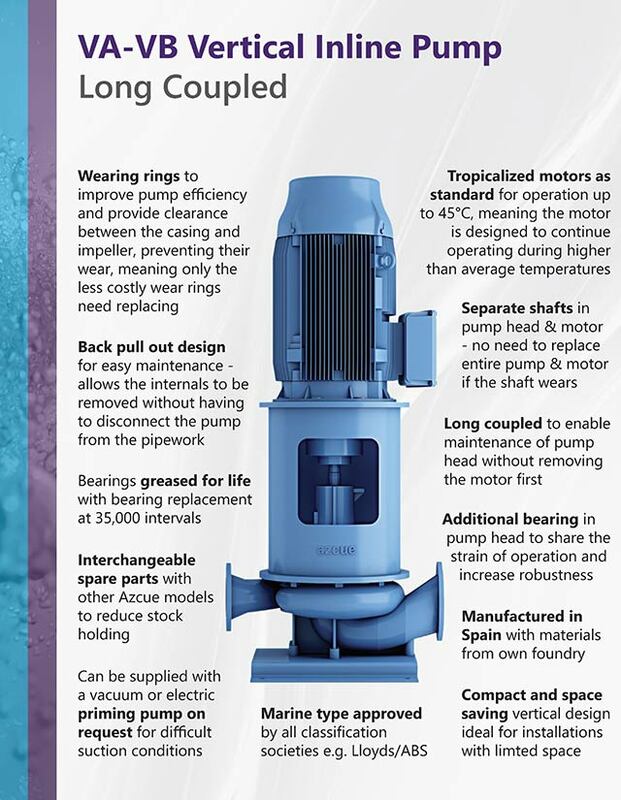 A further benefit of this centrifugal water pump are the separate shafts in the pump head and motor, meaning that if there is a problem with one, the whole thing doesn’t need to be replaced. This model has wear rings, which means there is small clearance between the impeller and pump casing preventing wear to these parts. Wearing rings are designed to be replaced periodically, preventing the more costly replacement of the impeller or casing.